So first off I’d like to apologize for the delay. 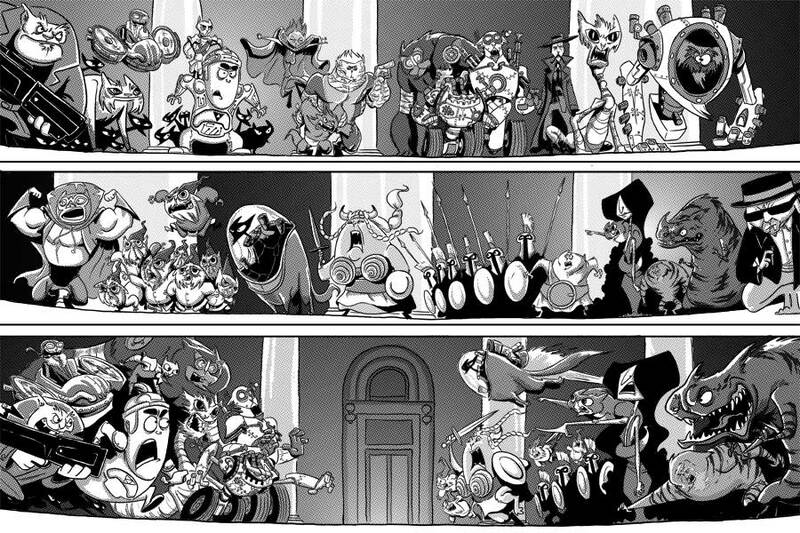 This strip ended up with around 56 characters give or take a few shadowy figures. Sooooo if you do the math I normally average around 10 to 20 figures per strip which would mean this equals almost 3 week’s worth of comics…right? The next strip may or may not be even more challenging than today’s. Which means I may hurt myself in the attempt and may also take a few extra weeks. I’ll do my best to keep you updated. The answer is I have been working on several projects that are Elmsfield related.The first being a graphic novel which I have been writing from the moment I stopped posting strips nearly two years ago and so far its made great progress. I always felt that Elmsfield was a little to big for the confines of a weekly strip and decided to give you all a more cohesive story to follow. The second big Elmsfield Project revolves around an animation I’m doing that’s has been in the works for the past year and I’m almost done with my first pass at the story boarding phase. I cant begin to tell you how excited I am about what its looking like at this point. I have no prediction when these will be finished but the plan with the graphic novel is to post the issues as I finish them, and as its planned now there are 13 issues in the works. I will do my best to post sketches or tidbits of my progress from here on out so you can keep an eye on where The building and its tenants are headed so be sure to check out my facebook or tumblr pages. For those of you who poked at me to find out details thanks for reading and ill do my best to bring you more asap.